The Pilgrims are the best known of America’s early settlers. Why did they undertake such a long and dangerous voyage to settle in the New World, and what problems did they have to cope with there? 1 | a) Nowadays it is hard to imagine that traveling to the U.S. used to be much more complicated and time-consuming — up to two months! Think about the risks and dangers of a sea voyage in the 17th cen­tury. Which problems did the passengers on the Mayflower face? How might the conditions on board the Mayflower have been (e.g. with regards to comfort, food, sleeping, supplies)? b) Have a look at Link 1 (Journey of the Mayflower) again and Link 2 (Mayflower and the Mayflower Compact). What are the most important aspects of the Mayflower and its voyage in 1620? c) Have a look at Link 1 and read the articles on “Daily Life” and “The Feast." After the Pilgrims had finally arrived in Plymouth, life there was not easy in the beginning. Explain what kind of problems they had to cope with and describe their relationship to the Native Americans. 2 | a) Imagine the situation of the Pilgrims when they finally arrived on the shores of New England. Which matters might the group have organized first? b) Read the Mayflower Compact below. In which context was it signed and what was its main purpose? Why did the Pilgrims find the Compact was necessary? Write a brief statement. […] In the name of God, Amen. We, whose names are underwritten1, the loyal subjects of our dread2 Sovereign Lord King James, by the Grace of God, of Great Britain, France, and Ireland, King, defender of the Faith, etc. 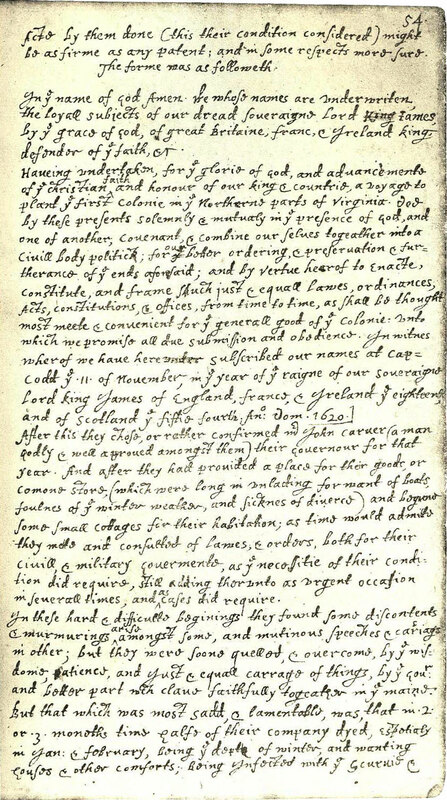 Having undertaken3, for the Glory of God, and advancements4 of the Christian faith and honor of our King and Country, a voyage to plant the first colony in the Northern parts of Virginia, do by these presents, solemnly and mutually5, in the presence of God, and one another, coven­ant6 and combine ourselves together into a civil body politic7; for our better ordering, and preser­vation8 and furtherance of the ends aforesaid9; and by virtue hereof to enact10, constitute11, and frame12, such just and equal laws, ordinances13, acts14, constitutions, and offices, from time to time, as shall be thought most meet and con­venient15 for the general good of the colony; unto which we promise all due submission16 and obedience17. In witness whereof we have hereunto sub­scribed our names at Cape Cod the 11th of November, in the year of the reign of our Sov­ereign Lord King James, of England, France, and Ireland, the eighteenth, and of Scotland the fifty-fourth, 1620.